Four forthcoming developments planned for areas immediately surrounding the recently-opened Los Angeles State Historical Park in Downtown Los Angeles’s Chinatown and Solano Canyon neighborhoods have the potential to completely reshape the industrial, working-class area into a new node for mid-rise, mixed-use urbanism. According to various reports and an environmental review, the four projects detailed below will bring up to 1,690 housing units, 92,406 square feet of retail and office spaces, and 2,962 parking stalls to several transit-adjacent lots currently occupied by industrial warehouses, parking lots, or hillside brush. The new 32-acre state park opened earlier this year after a lengthy approval and renovation process and will eventually link to a fully-restored Los Angeles River greenway. The largest of these developments will be the two-phase Elysian Lofts complex by developers Lincoln Property Company, S&R Properties, and architects Newman Garrison + Partners. 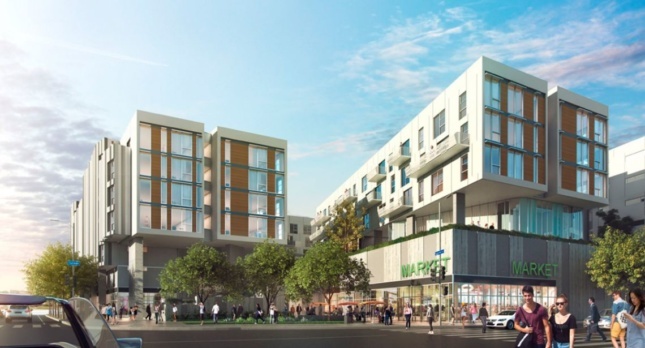 The linear development will be located on a long, narrow site bounded by the Gold Line and Broadway. The southern end of the 8.08-acre site closest to the Chinatown transit stop will be developed first. That section will include 451 residential units—including seven live-work suites— and 9,871 square feet of ground-floor retail. This phase will also include 3,465 square feet of office spaces and a three-level subterranean parking garage containing 880 parking stalls. Phase one of the project will be distributed across three mid-rise towers rising between 7- and 14-stories in height with the tallest tower topping out at 155 feet. The second phase of the project will improve the northernmost section of the site with 469 units, 8,070 square feet of retail, and 2,000 square feet of offices. This phase of the development will also include 10 live-work units. This second three-tower complex will sit atop a three-story parking podium with 903 parking stalls and will bookend a linear park located between the two development parcels. Phase two will be distributed across three mid-rise towers rising 7-, 8-, and 14-stories in height with the tallest tower topping out at 170 feet. The northern section of the site will also host a two-story structure containing a rooftop pool for use by residents. 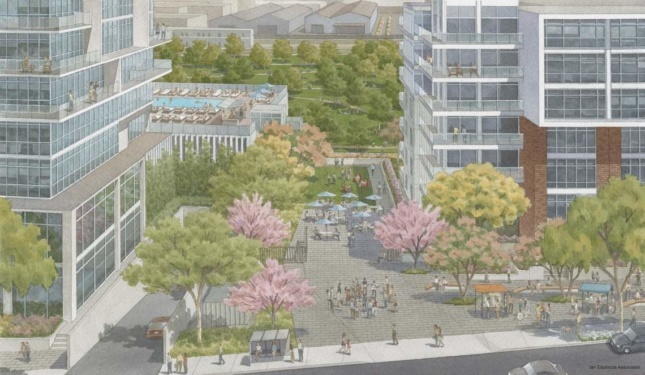 Renderings for the project depict grouped clusters of variegated mid-rise towers clad in large expanses of glass with views oriented over the State Historic Park. The development also features tree-lined sidewalks along Broadway and internal walkways but does not physically connect to the State Historic Park. According to currently available materials, the development does not include an affordable housing component. Just below the transit stop at the foot of the Elysian Lofts site, architects Workshop Design Collective is working on a 50,000-square-foot adaptive reuse project aimed at transforming the historic Capitol Milling Building. The brick- and timber-truss structure dates to 1881 and is being designed to include an artisanal food hall, a microbrewery, and creative offices among other uses. The five-building complex will be connected by a series of indoor-outdoor spaces that include a mezzanine level, dining terraces, and a public staircase. Across the street, architects Johnson Fain and developer Atlas Capital Group are working on a new mixed-use complex called College Station that will contain 770 dwelling units, 51,000 square feet of ground floor commercial spaces, and parking for 1,179 cars and 899 bicycles. The development will be spread out across six structures situated above a two-story podium containing parking and retail. The cluster of mid-rise housing blocks would be connected by a terrace level located above the podium. Renderings of the project depict a mix of linear apartment blocks featuring projecting balconies, metal panel cladding, and vertical louvers. The controversial project has been scaled down over time due to community concerns that it would jump-start gentrification in the area. Chinatown’s median household income is roughly $22,754 per year according to Preserve LA, and while the development is expected to contain some affordable housing, it is unclear whether those units would be affordable to current longtime residents. Just down the street from College Station, Omgivning is working on a 19,000-square foot adaptive reuse complex that would transform an existing poultry processing plant into a creative office and retail complex for developer City Constructors. The project involves designing the creative office portion of the building into a new 10,000-square-foot headquarters for the developer with the remaining 9,000 square feet of space dedicated to restaurants and retail. These projects are currently in various stages of development and will join a growing number of long-term proposals for areas surrounding Chinatown, the Los Angeles River, and the adjacent Olvera Street and Civic Center neighborhoods that include a new master plan as well as a speculative proposal by AECOM to add 36,000 housing units to areas around the L.A. River. With construction ramping up and new schemes coming to light almost weekly, it’s clear that the areas around L.A.’s Chinatown will soon look very different than they do today.